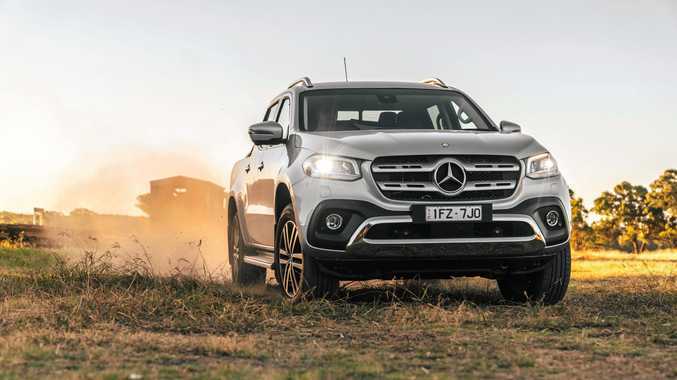 The Mercedes-Benz X-Class in range-topping Power specification. STANDING in front of his Nissan Navara, the bloke quipped "How do you like my Mercedes”. 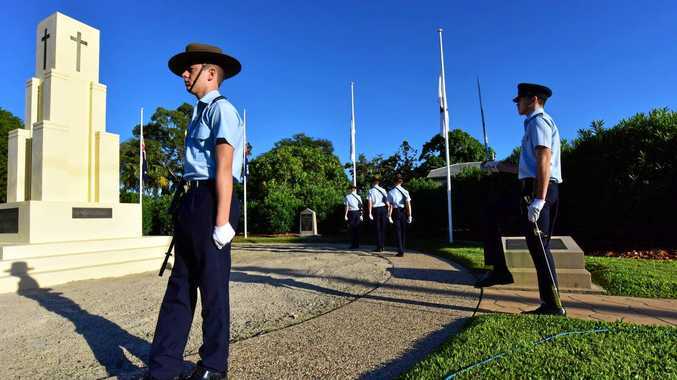 It's not the first time the tongue has been placed firmly in cheek when referencing the new three-pointed-star ute. 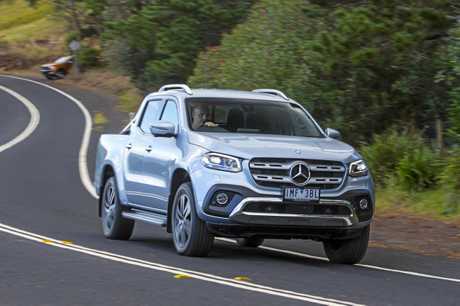 The Mercedes-Benz dual-cab shares its underpinnings with the Navara ST-X, a partnership which enabled the famed German marque to fast-track X-Class production. Priced from $50,400 for the ultra basic variant and rising to $61,600 plus on-roads for the Power range-topper. 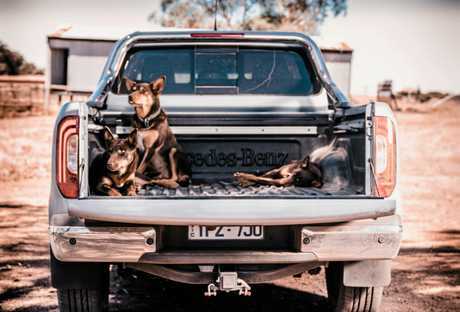 Those price-tags were at the upper end of the ute market, before some souped-up editions hit the market. We've since seen Toyota unleash its Rugged HiLux, HSV has delivered the Colorado Sportscat, and the release of the Ford's Ranger Raptor is scheduled for October. Suddenly the thought of getting a Benz with a bloody big boot sounds appealing. Step inside and most association with the Navara is banished. There's ample bling across the dash, with the now trademark jet-turbine looking vents, concave chrome finishes and a central colour display. Our experience in the top-shelf Power model was bolstered with the best kit available, with the bigger 8.4-inch screen (up from seven), surround-view camera, 18-inch alloys, LED headlights, keyless entry, satnav, synthetic leather seats and instrument panel binnacle, climate control aircon, power front seats and semi-automated parking. Push button start is also standard, but it's weirdly positioned on the steering wheel column rather than being on the dash. One devout Navara owner found it all too fancy ... but there is always the base Benz Pure variant with a vinyl floor and steel wheels. Resale value is yet to be seen given it's an all-new model, while the warranty is short by mainstream standards at three years (par for the course in the prestige world). 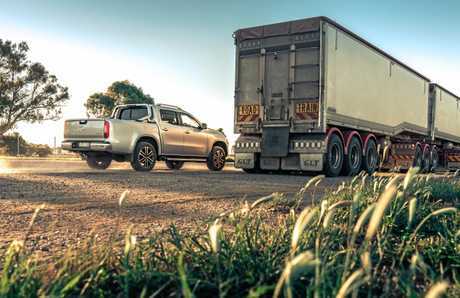 Capped price servicing is available for $2350 for three years or 60,000km, with maintenance scheduled annual or every 20,000km - over $780 more expensive than the Navara. Options, too, can be expensive. A sports bar is $1551 and the tinted rear windows and sliding back window are part of a $2490 option pack that includes 19-inch alloys, side steps and roof rails. Leather seats are an extra $1750. Sharing the Navara's 2.3-litre four-cylinder turbo diesel with identical power outputs, the key difference comes in weight. Extra insulation for improved cabin quality adds 180kg from the donor vehicle. For caravanners, the gross vehicle combined mass (maximum allowable weight including tow vehicle) is 6130kg compared to 5910 in the Navara. The turbo diesel is actually sourced from Renault, and it's an honest unit. It's punchy enough for most activities, but like the majority of utes it's no dragster with a 0-100km/h time of about 11 seconds. Those looking for additional poke would best wait for the V6 arriving in December - it's also a German-derived donk built in Berlin. That's to do the sprint in a lithe 7.6 seconds. 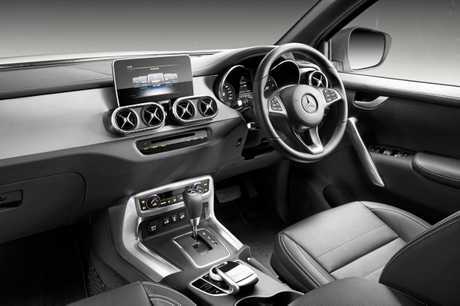 Work done by Mercedes engineers has paid dividends with a quiet and refined cabin. The diesel can be noisy from start-up, but it's well muted once under way. Improvements don't translate to the driving experience. Having spent extended time in the Navara this year, the X-Class lacks the ride quality and steering prowess of the Nissan. The Mercedes has a wider track (distance between the wheels), along with completely different suspension. But Nissan adopted a five-link dual rate system with the Series 3 released during February this year, and it's vastly improved over its predecessor. With the X-Class on 19-inch alloys, the Navara riding on 18s feels more confident and composed. Fuel efficiency remains solid, and our test returned an average of 7.7 litres per 100km - unusually better than the official figure. Setting a new standard, Mercedes has introduced autonomous emergency braking to one-tonners. It's also armed with lane-keeping assist which vibrates the steering wheel if you drift on to lane markings (although it doesn't steer you back into the lane like other Benzes, nor does it have radar cruise control). Tyre pressure monitoring and a rear camera are also standard, along with 360-degree helicopter camera view coverage. Parents will appreciate the two Isofix points available in the back for child seats. 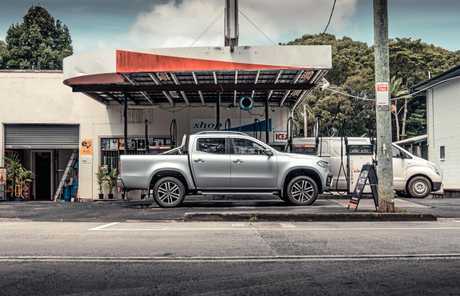 Impressive safety technology and classy cabin finishes collectively deliver a ute with the ultimate badge kudos. I know it's a Navara under the skin, but it's got a three-pointed star on the grille and I can leave my key on the restaurant table with pride. Even if it's just a Nissan key with a Mercedes logo. Price is for the updated model due in September, with 157kW/500Nm 2.0-litre twin turbo diesel/10-speed automatic/dual-range 4WD, AEB with pedestrian detection, adaptive cruise and 961kg payload. Five years' warranty. German engineering also running a four-cylinder 132kW/420Nm 2.0-litre turbo diesel, with a smooth driving experience but doesn't have the same fit, finish or features of the Benz. How much is the first 20cm of your car worth? Plenty. 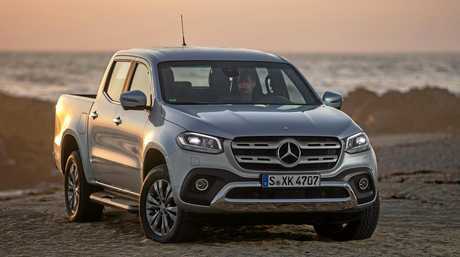 The X-Class sells on the three-pointed star alone, and it will only get better as it becomes 'more Mercedes' with the next iterations.